Ray Clark 01/17. Andrew Flower 01/17. 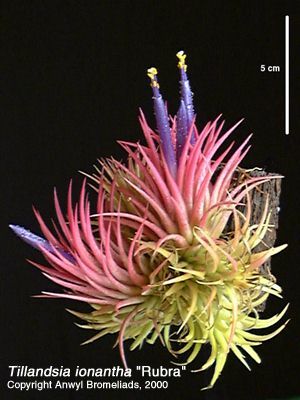 Ray Clark ... "I have no doubt that the T. ionantha rubra tag will get some attention. I cannot see it formally referred to anyway, so is probably not registered or recognised maybe? I bought it at a BSSA meeting in July 2009, the seller tag was H3. Any clues who that would have been? Whatever the actual name is secondary for me in this instance as I like the way it grows, very hardy and no fussing." 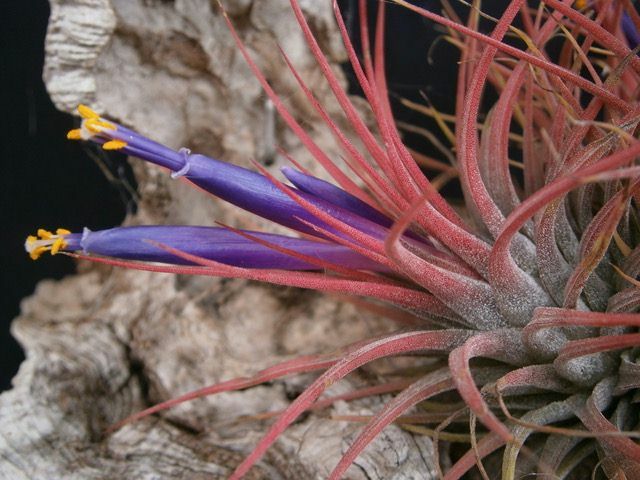 Andrew Flower ... "For what its worth, I found an old (2000) photo of a "Tillandsia ionantha rubra" imported from USA in 1991/92 - most likely from Tillandsia International. 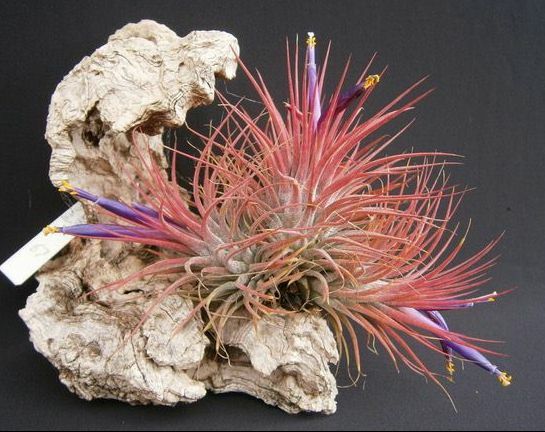 This is the plant used in most of my T. ionantha hybrids." Derek Butcher ... "There is a T. 'Rubra' on the BCR but your photos are better so why not add yours. I think H3 is Maureen Hick." Chris Larson ... "Ray, yours looks very similar to what I remember was in Pam’s BSI article back so long ago. For many years the Guatemalans supplied mainly the plant that you have photographed along with a couple of other more “open” forms at the cheapest of prices under this name. They basically had 2 forms “T. ionantha var ionantha” & T. ionantha var rubra” at the cheap price. Then at higher prices they would have T. ionantha Fuego & T. ionantha Penito. The ionantha var ionantha were usually more xeric with stiffer upright foliage. Over the past 5 to 10 years there have not been so many of the finer form of “T. ionantha var rubra”, as shown in Ray’s photo, amongst the shipments. They have tended to be more & more similar to the ones in Andrews picture – though I did see plants similar to Andrews over the years on regular occasions."